Gideon and Jennifer Chisamba and their "Fountain of Hope" organization have been involved in the community of Mthombothemba since 2000. Their main mission is to combat the spread and reduce the impact of HIV/AIDS on orphans and vulnerable children, women, and the community at large through the provision of orphan care services, HIV/AIDS workshops and community based development projects. a) Refurbished two dams in a wet area. On the bottom dam they have developed a community garden, approx ½ acre. 20 families have 16 beds each inside a fence. They all help and encourage each other. They have a treadle pump from the reservoir to a large cistern in the middle of the garden. b) Refurbished a cattle dip in village A. This had been built in the late 1800's but was unable to be used for many years. Tick borne diseases are a real issue and this has made a huge difference to the community and the health of their animals. 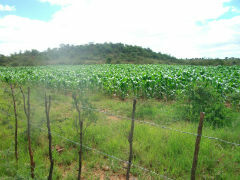 c) Set up a community garden in village A. They had a well and bought an electric water pump. This now has nine members and they are responsible for the ongoing costs and maintenance. They are planning to double the size of the garden to around ½ acre and others now want to join the group. d) Set up a goat programme for orphans and for families in the community. The idea for both of these is that each family should receive 10 goats so they immediately get the benefits from having the goats. If they only get a small number of goats, the benefits take too long to accrue. If they get goats, they then come off the education and feeding programmes and are responsible to send their children to school and care for them. e) Started funding children to school. They see this as a short term issue and hope that the development of gardens and the goat programme will reduce the need for this. Every child at the local school has been assessed and those most vulnerable are assisted to get to school. f) Set up a feeding programme. Around 68 children are fed every day. These are the most vulnerable in the community. Each child is assessed, many of them would get at most one meal a day, some days many would go without food. As with the education programme it is expected that this will go down as families are empowered economically. g) Undertaken Foundations for Farming training. This has already made a huge difference to their maize crops and in fact a lady here won the prize for the best maize cob at the district agriculture show last year! Fountain of Hope endeavours to see the community rising up and being able to run income generating projects which will take families out of poverty and break the cycle of depending on hand-outs. This partnership focuses on providing funds to get the most vulnerable children in the community into school and feeding them once a day, providing goat loans to families of vulnerable children so they can afford to send their own children to school, and training local communities in Foundations for Farming methods and mind sets. There are many beneficiaries here. Families are becoming self-sustaining and sending their children to school. Dams are being refurbished and gardens are being grown. Children are safer and better educated. The morale in the whole community has improved. People are eating better and are learning to work and take responsibility for their families. The children are learning better because they are eating better. People are better off economically and young people are beginning to stay and work rather than go into town. All round there is a dramatic improvement. Gideon and Jennifer understand that transformation requires a broad based holistic approach to solving the issues and the starting point has been building relationships with the community. We are encouraged by the commitment of Gideon and Jennifer to this community - they have been involved here for a long time and have seen God working miraculously in this community through the various programmes they have started in consultation with the community members. 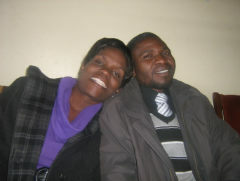 The project co-ordinator is Hidliza Ncube (Mr H). He is married, is from this community and lives in the community. He joined the team from working 10 years in a mushroom business. His role is to engage the villagers and monitor the projects they operate. This involves visiting, talking, chairing meetings and checking the finances. Daniel is the father/grandfather of eight children. Two are his children and six are his grandchildren. Only two are going to school and last year one child had to drop out of school a month before sitting his 'O' levels. This made Daniel very frustrated. Life has been hard for Daniel since he had an accident in the 1970's. He was working in an office in town but had to quit as he was badly injured. He is not a strong person physically. He has been given two goats from the loan programme to add to the 10 he has. It is still not enough although it does help a little with school fees. Last year two of the older children were taken from him and brought to Peniel Home (ZIM02). The boy, about 14, was HIV+ and very ill. He has improved remarkably and is on ARVs. The 12 year old girl had been raped repeatedly by a neighbour and uncles. The case was taken to court but there was bribery and no outcomes were achieved even though Gideon became involved.